Submission (French: Soumission) is a novel by French writer Michel Houellebecq. The French edition of the book was published on 7 January 2015 by Flammarion, with German (Unterwerfung) and Italian (Sottomissione) translations also published in January. The book instantly became a bestseller in France, Germany and Italy. The English edition of the book, translated by Lorin Stein, was published on 10 September 2015. The novel imagines a situation in which a Muslim party upholding Islamist and patriarchal values is able to win the 2022 presidential election in France with the support of the Socialist Party. The book drew an unusual amount of attention because, by a macabre coincidence, it was released on the day of the Charlie Hebdo shooting. The novel mixes fiction with real people: Le Pen, François Hollande, François Bayrou, Manuel Valls, and Jean-François Copé, among others, fleetingly appear as characters in the book. In 2022, François, a middle-aged literature professor at Paris III and specialist in Huysmans, feels he is at the end of his sentimental and sexual lives – composed largely of year-long liaisons with his students. It has been years since the last time he created any valuable university work. France is in the grip of political crisis – in order to stave off a National Front victory, the Socialists ally with the newly formed Muslim Brotherhood Party, with additional support of the Union for a Popular Movement, formerly the main right-wing party. They propose the charming and physically imposing Islamic candidate Mohammed Ben-Abbes for the presidency against the National Front leader Marine Le Pen. In despair at the emerging political situation, and the inevitability of antisemitism becoming a major force in French politics, François' young and attractive Jewish girlfriend, Myriam, emigrates to Israel. His mother and father die. He fears that he is heading towards suicide, and takes refuge at a monastery situated in the town of Martel. The monastery is an important symbol of Charles Martel's victory over Islamic forces in 732; it is also where his literary hero, Huysmans, became a lay member. Ben-Abbes wins the election, and becomes President of France. He pacifies the country and enacts sweeping changes to French laws, privatizing the Sorbonne, thereby making François redundant with full pension as only Muslims are now allowed to teach there. He also ends gender equality, allowing polygamy. Several of François' intellectually-inferior colleagues, having converted to Islam, get good jobs and make arranged marriages with attractive young wives. The new president campaigns to enlarge the European Union to include North Africa, with the aim of making it a new Roman Empire, with France at its lead. In this new, different society, with the support of the powerful politician Robert Rediger, the novel ends with François poised to convert to Islam and the prospect of a second, better life, with a prestigious job, and wives chosen for him. The book generated controversy and criticism for its portrayal of Islam. In advance of the novel's publication, French Prime Minister Manuel Valls declared, "‘France is not Michel Houellebecq . . . it’s not intolerance, hatred, fear.” Lydia Kiesling, writing for Slate, stated, "There is a way in which Submission is not, strictly speaking, Islamophobic. But it does Aylan Kurdi no favors." The New York Times likewise argued Submission "plays on French fears of terrorism, immigration and changing demographics." … I can't say that the book is a provocation — if that means saying things I consider fundamentally untrue just to get on people's nerves. I condense an evolution that is, in my opinion, realistic. Rob Doyle of The Irish Times found the themes of the book favourable to Islam, stating Houellebecq "suggests that yielding to the rule of Islam, with its reassuring social and sexual hierarchies, might be a good option for an otherwise terminal Europe." Steven Poole, writing for The Guardian, noted that the book was "arguably, not primarily about politics at all. The real target of Houellebecq's satire — as in his previous novels — is the predictably manipulable venality and lustfulness of the modern metropolitan man, intellectual or otherwise". Adam Shatz, writing for the London Review of Books, states that it "is the work of a nihilist not a hater – the jeu d’esprit of a man without convictions". Some critics also suggested the novel promoted misogynistic views. Erik Martiny's review in The London Magazine highlighted that "gender hierarchy is presented in the novel as the essential backbone to a healthy, stable society." Heller McAlpin's review for the NPR concluded with the line, I'm hoping that women, at least, won't take this insulting scenario lying down," while Lydia Kiesling contextualized the book's depiction of women by stating Submission contains a "Evo-Psych 101 correlation of women’s worth with their sexual viability" prevalent in both Houellebecq’s work and his personal comments. On 5 January 2015, French president François Hollande announced in an interview for France Inter radio that he "would read the book, because it’s sparking a debate". There's a real disdain in this country for all the authorities... You can feel that this can't continue. Something has to change. I don't know what, but something. The German translation (Unterwerfung) by Norma Cassau and Bernd Wilczek was published on 16 January 2015 by DuMont Buchverlag. Lorin Stein translated the book into English. The book was an instant bestseller. Several critics, including Bruno de Cessole of Valeurs Actuelles and Jérôme Dupuis of L'Express, compared the novel to Jean Raspail's 1973 novel The Camp of the Saints, a novel about the political impotence of Europe during a massive wave of immigration from India. Grégoire Leménager of Le Nouvel Observateur downplayed the similarities to The Camp of the Saints, as Submission does not deal with ethnicity, and instead placed Houellebecq's novel within a trend of recent French novels about immigration and Islam, together with La Mémoire de Clara by Patrick Besson, Dawa by Julien Suaudeau and Les Événements by Jean Rolin, speculating that the concept of the "Great Replacement" ("Grand Remplacement"), as formulated by Renaud Camus, was becoming fashionable as a literary device. Le Pen stated in an interview with France Info radio that the novel is "a fiction that could one day become reality." Mark Lilla, in The New York Review of Books, stated similarly that "Europe in 2022 has to find another way to escape the present, and 'Islam' just happens to be the name of the next clone." French novelist Emmanuel Carrère compared Submission to George Orwell's 1984. A monologue stage performance with Edgar Selge as François toured Germany in early 2016 with dates in Hamburg, Dresden and Berlin. According to Die Zeit, interest in the story was piqued by the New Year's Eve sexual assaults in Germany. A German film adaptation, based both on the novel and the stage performance, was produced by the television channel Rundfunk Berlin-Brandenburg as Unterwerfung. The film stars Selge who reprises his role from the stage version. The film premiered on German public broadcaster ARD on 6 June 2018, followed by a roundtable, which resulted in "a broad internet discussion," in calls for all German political talkshows to be suspended for one year, and in an apology from ARD presenter Sandra Maischberger. ^ a b Bourmeau, Sylvain (2 January 2015). "Scare Tactics: Michel Houellebecq Defends His Controversial New Book". The Paris Review. Retrieved 8 January 2015. ^ Willsher, Kim (16 December 2014). "Michel Houellebecq provokes France with story of Muslim president". The Guardian. Retrieved 8 January 2015. 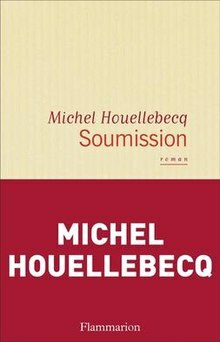 ^ "Après le buzz, "Soumission" de Michel Houellebecq arrive en librairie" (in French). Libération. 7 January 2015. Retrieved 8 January 2015. ^ a b Flood, Alison (16 January 2015). "Houellebecq's Soumission becomes instant bestseller in wake of Paris attacks". The Guardian. Retrieved 2 November 2015. ^ Grey, Tobias (22 September 2015). "Houellebecq's 'Submission' Comes to America". Wall Street Journal. Retrieved 2 November 2015. ^ "Submission by Michel Houellebecq: This provocative novel charts France's plunge into Islamism". International Business Times. 28 August 2015. Retrieved 9 September 2015. ^ Rosenthal, John (May 2015). "Houellebecq's 'Submission': Islam and France's Malaise". World Affairs. Retrieved 2 November 2015. ^ "Bayrou stupide et Copé moche : quand Houellebecq dézingue les politiques" (in French). Metro News. 6 January 2015. Retrieved 8 January 2015. ^ ""'Islamophobic' novel hits the shelves in France"". The Local. January 7, 2015. Retrieved April 15, 2019. ^ a b Doyle, Rob (September 12, 2015). ""Review: Submission, by Michel Houellebecq"". The Irish Times. Retrieved April 15, 2019. ^ Kiesling, Lydia (2015-10-06). "The Elegant Bigotry of Michel Houellebecq's Submission". Slate Magazine. Retrieved 2019-04-16. ^ Kakutani, Michiko (2015-11-03). "Review: Michel Houellebecq's 'Submission' Imagines France as a Muslim State". The New York Times. ISSN 0362-4331. Retrieved 2019-04-16. ^ Poole, Steven (9 January 2015). "Soumission by Michel Houellebecq review – much more than a satire on Islamism". The Guardian. Retrieved 10 January 2015. ^ Magazine, The London (2015-07-27). "Submission by Michel Houellebecq review". The London Magazine. Retrieved 2019-04-16. ^ "Don't Take 'Submission' Lying Down". NPR.org. Retrieved 2019-04-16. ^ Fouquet, Helene (7 January 2015). "Was Attack Linked to Novel About France Under Islamist President?". Bloomberg. Retrieved 8 January 2015. ^ Kachka, Boris (8 January 2015). "What Michel Houellebecq Represented to the Charlie Hebdo Shooters". Vulture. Retrieved 8 January 2015. ^ a b "Paris terror attack: Controversial book launched on same day as attack". The New Zealand Herald. 8 January 2015. Retrieved 10 January 2015. ^ "Michel Houellebecq über "Unterwerfung": "Meine Thriller-Seite"" (in German). Westdeutsche Allgemeine Zeitung. 4 January 2015. Retrieved 8 January 2015. ^ Samuel, Henry; Marszal, Andrew (7 January 2015). "'Islamophobic' Michel Houellebecq book featured by Charlie Hebdo published today". Telegraph.co.uk. Retrieved 10 January 2015. ^ Cessole, Bruno de (8 January 2015). "Celui par qui le scandale arrive". Valeurs Actuelles (in French). pp. 20–21. Retrieved 26 July 2015. ^ Dupuis, Jérôme (7 January 2015). "Soumission de Houellebecq: Big Brother revu par Guignol". L'Express (in French). Retrieved 26 July 2015. ^ Leménager, Grégoire (18 December 2014). "Houellebecq, Besson, Rolin... 'le Grand Remplacement', sujet de roman?". Le Nouvel Observateur (in French). Retrieved 26 July 2015. ^ "Irrepressible". The Economist. 10 January 2015. Retrieved 10 January 2015. ^ "A French Muslim president? New play hits raw nerves". Al-Arabiya. Agence France-Presse. 9 March 2016. Retrieved 9 March 2016. ^ dpa-infocom (6 November 2017). "Edgar Selge dreht Houellebecqs 'Unterwerfung'". Die Welt (in German). Retrieved 26 February 2018. ^ Matthias Dell (6 June 2018). "From lust to the horror scenario". Die Zeit (in German). Retrieved 14 June 2018. Submission" premieres on Wednesday, June 6, at 8.15 pm and is then available in the media library. Sandra Maischberger discusses the film in her subsequent talk show with the title: " The Islam debate: Where does the tolerance end? ^ "Kulturrat calls for a one-year break for talk shows". Die Zeit. 7 June 2018. Retrieved 14 June 2018. The aim of the German Cultural Council is to "stimulate cultural policy discussion at all political levels and to advocate freedom of the arts, publications and information."